-ONE- I'm slightly obsessed with Crate & Barrel, and they always pull me in with their festive items. 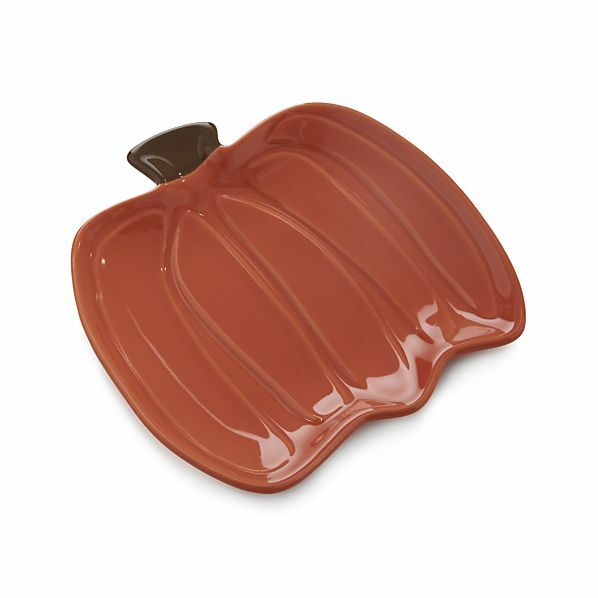 Most recent unnecessary purchase... this pumpkin spoon rest! It's absolutely adorable! And again, a simple yet perfect hostess gift for this time of year! 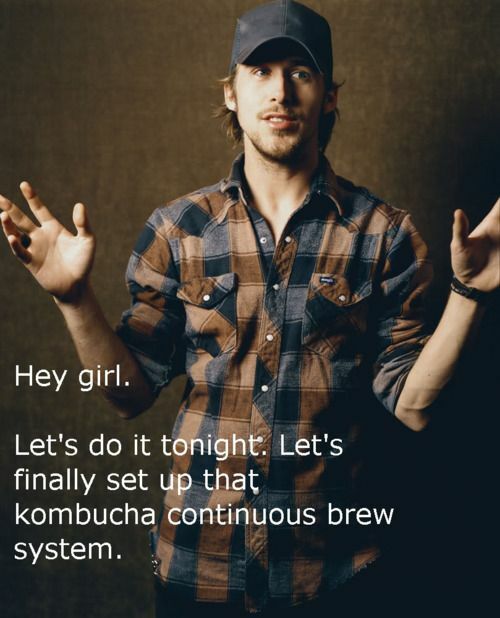 -TWO- I have a serious kombucha addiction right now! The Whole Foods in downtown SLC has it on tap, so I expect many many visits to keep filling my growlers. Perhaps I will get adventurous enough to brew my own one day, but I'm not ready for that level of hippy yet! -THREE- So Liam was supposed to be a fox for Halloween. We had settled on this idea well more than a month ago. And then just days before I was about to buy all the materials and get started on it, he decides he wants to be a frog. No idea where this came from, but it doesn't sound nearly as cute. But it's not about me...so a frog costume I will make. 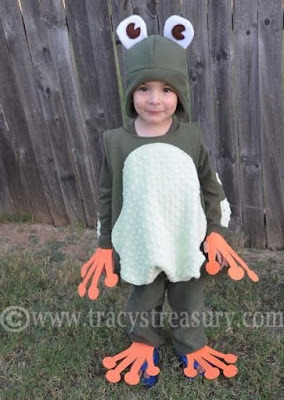 I've scoured Pinterest, and there aren't many cute options, so I'm going to take my own spin off of this frog costume. I'm hopeful that my version will still be adorable! - FOUR- I'm loving this rug!!! Only I don't really have room for a kitchen rug, and this would be a bit loud. 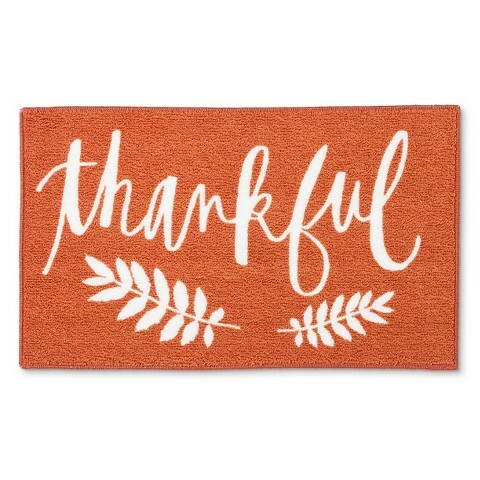 If only it were a door mat, then I would be sold! -FIVE- I really want to get Liam some flannel sheets for the winter season, so naturally they need to come in a Christmas-y pattern. So many options, I can never decide. I'm liking the deer or the snowflakes, but I can't commit yet. What if there is better out there?! Oh! I love the deer flannel sheets and man I'm a sucker for unnecessary holiday items. Oh I love the frog idea! He can hop around saying ribbit! I'm sure you'll make it adorable. Maybe go with a more vibrant green than the one in the picture. 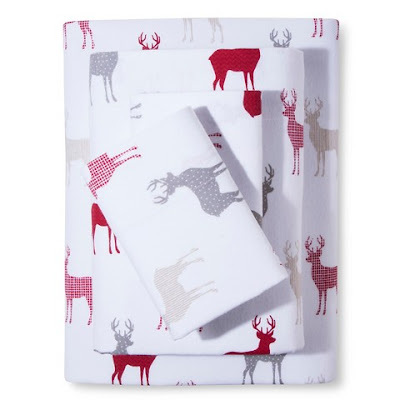 Pottery Barn has some insanely adorable Christmas sheets - they are a tad pricey - but SO cute!! I have yet to pull the trigger on them myself, but they have been sitting in my online cart for quite some time. Ahhhh! I think you'll make a super cute frog! Aria wants to be a dog, but I'm having a hard time finding anything FL appropriate. I'm not very handy with the sewing but I think I'll need to try and DIY something. Kids just know how to be difficult! crate and barrel, ugh they will be the death of my wallet haha. i'm sure the frog costume will be completely adorable :) how cute is that rug? i need it. have a good weekend! Those sheets are adorable! I really want to get some 'holiday' bedding, but the hubs thinks I'm ridiculous. lol. Hope you guys have a great weekend! Ah, so my brother-in-law is making him own kombucha and he was telling me you have to have the "mom" (or something like that) from someone else's batch to start your own? It sounds so complicated, but really interesting! And can you believe I have never had it before? Is it safe to have when you're pregnant? Those Christmas flannel sheets are so cute! I just bought Owen a pair of blue flannel sheets at Costco for $14.99 such a steal compare to the PBK ones I originally wanted to buy! Have a great weekend! Haha I have flannel sheets sitting in my cart right now because I can't decide on a pattern!! And Liam is going to be the cutest little frog ever! Happy Friday! I love that rug!!! My kitchen color is orange and would just be perfect! I love that pumpkin spoon rest, totally justifiable. Now it has a place to rest the spoon instead of using a plate. I love flannel sheets in the winter. I love the ones you linked. I always had flannel winter printed sheets when I was a kid - it was one of those happy memories! Hope you find some! Love that little frog! Mac is insisting on being Buzz Lightyear - boring. I think I'm just going to do one of those prepackaged storebought costumes and cry. How funny that we posted about those rugs on the same day! haha, that's so funny--a frog!! That is kind of random. Maybe some kids at school were talking about frogs or something. I really want Wyatt and Stella to "match" so I'm having a hard time choosing their costumes. I've always loved Christmas sheets; they're just so festive! Ooh, I need that rug!